Wednesday morning’s sunrise at Old Beach Lane was magnificent, I can’t describe the feelings I have as I sit here and think about the journey that got me to this place. Upon arrival in East Hampton I was at a fork in the road. This community has often reminded me how lucky I am having taken the right turn. We signed a lease with Dell Cullum in February of 1991. The small storefront on Amagansett’s piece of 27 East was called Estia back then. I was determined to set up a restaurant in what was a coffee shop; the next day Jessica and I got started. Without the help of people like Marie Miller, Linda Palmer, and John Papas that determination would have been short-lived. A few days later a tall man with a big smile walked through the door. He introduced himself as Terry the health inspector, another key player in our 25-year marathon in the restaurant world on the East End. Over the years I’ve learned to cook, thanks to my friends and Basil Brothers Dennis MacNeil, Gerry Hayden, and Charlie Palmer. 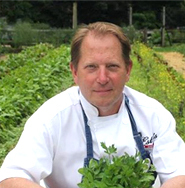 I’ve learned to take food from seed to plate under the watchful eye of a master, Scott Chaskey, and I’ve learned to take opportunity as it comes. In the winter of ’96, when a new sales rep for the Sagg Pond vineyard (now Wolffer Estate Vineyard), Gayle Hann, introduced me to the iconic chef Michael Romano, I was pleased to have him in for breakfast. When he asked me if I could take the next three-week shift on his pasta station at Union Square, I was thrilled. I did it, not always as well as others but in the end it was one of those things that has made me the competent chef I am today. I’ve also learned to look to this community for help. That happened early on. In the first summer, on a hot, crowded Saturday night, my newest hire, Long Suciu, came up from the basement with terror in his eyes. The electrical panel had just blown up and was in flames. The fire department was called, and in three minutes I was surrounded by my neighbors Joe LaCarrubba, Michael Cinque, John Alexander, and, to my great comfort, Terry O’Riordan, the health inspector. Where else in the world does a new guy like me find himself in a jam and get such highly regarded help in a moment’s notice? To say I’m grateful for my choice to serve this community is an understatement. With 25 years under my belt as a chef, waiter, bartender, dishwasher, gardener, owner of Estia operations, the most important group that I can thank is the long list of people who have walked into my kitchens, served coffee and Long Island wine, cleaned the bathrooms, and showed up on a moment’s notice to cover anther’s shift. I can immediately think of Virgil Suciu, Long’s dad, and all of his family. The Matlick family, who all worked for me. For those who visit us in Sag Harbor you might know our amazing team Julia, Pamela, Cesar, Irwing, Matilda, Raul, Tomasa, Maria, and Juana. All working hard, smiling through challenges, and showing up on time to work long hours, following literally hundreds of others who have served breakfast, lunch, and dinner in Estia’s dining rooms. Then there’s the kitchen crew: Ruben Bravo, Mike Ruggerio, Laura Donnelly, Chris Polidoro, Jeff Winters, Bam bam, and so many others. They’ve all helped me to start and finish every season, then walk through the winter quietly serving the community that supports us year after year. I could go on for a long time, but time doesn’t allow. This is a special day. The Little Kitchen is closed to celebrate Estia’s 25th anniversary (under my watch) with a fiesta by taking a siesta. The staff in Sag Harbor deserves a day off. Expressing thanks to all who have helped me in my journey with Estia, especially my bride, Jessica, who had no idea what she was getting into when she agreed to sign the lease in Amagansett alongside my name. She’s shared a life beyond my wildest dreams, and made the best dreams come true by standing at my side in February and March, then running after me in June, followed by sitting on the beach and waiting for me to come home in July and August. The three children we share, Lyman, Mansell, and Whittier, are priceless, again thanks to her and all who have worked at my side in the restaurants and in our homes. My daughters have learned to take time, plant a seed, let it grow, and then at harvest time celebrate the effort. My Estia’s family has made a difference in all of our lives. 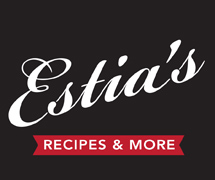 Thanks for sharing this journey with me at Estia’s. This community is my home, and for that I’ll always be grateful. What a beautiful letter! And your food is wonderful. Thank you. Thanks Kris, we share the love everyday but Tuesday.